I love the big Samsung curved TV's. Will get one when TV goes out. Not sure about as a monitor as I'am using a 55 inch at the moment. I'am using a 55 inch at the moment. Now that I'm using it, making widgets, fixing up wallpapers (old HP monitor was a 20"), etc. I get the immersive thing as when you work on the PC all your attention is focused on what you are doing. Glad the old monitor died it was a work horse for 7 or 8 years. I don't have room for that big a monitor! I love my LG 34UC88-B. Tested it for 15 minutes and never want to give it away again since then. Even have the same at work and at home. Just looked it up and I must say it looks like it's an awesome monitor! I wouldn't want to give that one up either. I love the big Samsung curved TV's. I am using a 49 inch Samsung curved 4K UHD TV as a monitor. Not so great. As a TV, it is awesome. Watching movies on it is almost like 3D! It's like being in the scene with the actors! 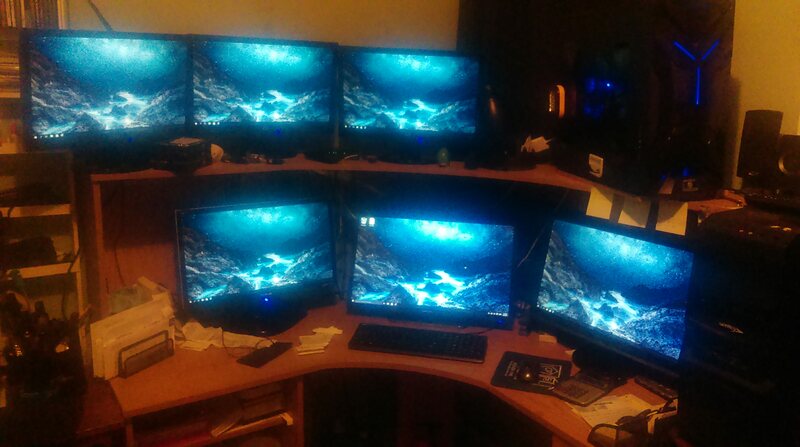 I run 3x 27 inch Benq monitors on my main rig. Situated like you just described. I love them! I also run 2x 32 inch monitors in my PC shop. 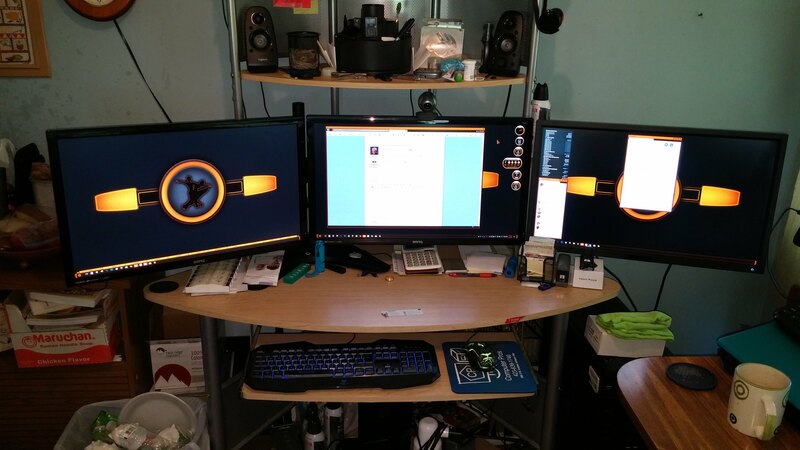 And a 3 monitor rig in my home office. Also 27 inchers. Once I went multi monitor, I never liked single monitor systems again. 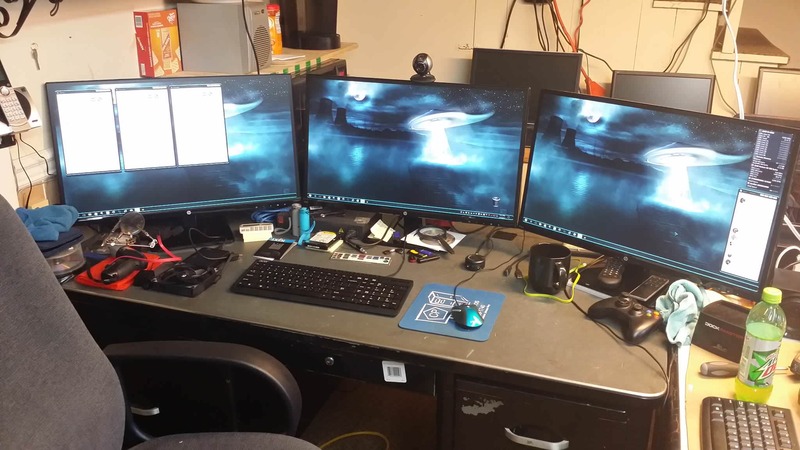 I used to run 6 monitors in my office. Awwwwwwwwww, I only run two 27" BenQ's Jim. My third 27" BenQ is in the living room with a Win 10 ASUS PC Stick on it. Nothing, absolutely nothing, beats a BenQ! I'm kinda liking mine, thanks to a good friend hooking me up!! Really nice setup Jim! Do me a favor though... empty the trash! I wouldn't mind getting a nice curved monitor. You'd have to pay me to get a curved TV though. I'm pretty sure I read an article way back where the only reason they started making them curved was it was cheaper with that particular tech. So then the marketing team went into overdrive to convince us that curved TV's are AWESOME. The problem with that is there is one sweet spot for curved screens, ideal for a computer monitor, not so much for a TV in a living/media room. Unless you go super, super huge like IMAX or some of the other things similar to that. Just my opinion though! I love my curved TV. Watching it is like being in the same room with the actors. It has Auto Depth Enhancer It adds depth. 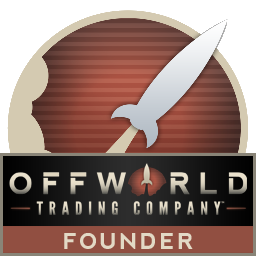 Makes it more real. YMMV. How do you work with a 55" monitor? My nexk would get tired from turning my head from side to side. Only thing I don't like about my BenQ is it sometimes doesn't wake up from sleep mode. I need a firmware update but according to the tech I spoke to I need t send it to them for that. I think you mentioned that before gevansmd, and really sorry to hear that. Did you buy it as brand new or re-manufactured? If you bought it new they should do that firmware update for free I would think. They should not be selling anything new that needs a firmware update. In my opinion, that should apply to re-manufactured too! I think I said once before I don't have that issue on mine, but then again I turn sleep and hibernate modes off on all OS's. Useless functions for me here. Yeah, you and I discussed in PM but I wanted to get that info out here. I can update the firmware of my blue ray play over the internet but not a monitor? Strange. Yeah, I find that really strange too. Thanks, I will look at the sites the search found. Interesting, the first one I opened said BenQ removed the firmware updates from their website. Also Jim next time add a picture of me next to Lightstar. Tom is on the center monitor. After all you do have 2 other monitors in case you want me on my own monitor. With the 55 inch, I don't have to wear my glasses. My plasma (65 inch) 3D is in the living room. When I go to the store and see the 55 inch curved Samsung it does look like its 3D even though its not. When my plasma goes teats up I will replace it with a 75inch curved Samsung. You know, I didn't even notice that Dave! I have a 34" LG. Any wider than that I would recommend a curved screen.